Preheat the oven to 200 C and grease a large roasting pan with oil or non-stick spray. COUSCOUS: Bring the water, salt and oil to the boil in a saucepan and add the couscous to the boiling water. Cover and steam the couscous over low heat. Stir in the butter and fluff the couscous with a fork. Cover and leave to stand for a few minutes. BUTTERNUT AND FETA MIXTURE: Meanwhile put the butternut and onion in the prepared roasting pan. Season with salt, pepper and rosemary and drizzle with a little olive oil. Roast for about 20 minutes or until done and golden. 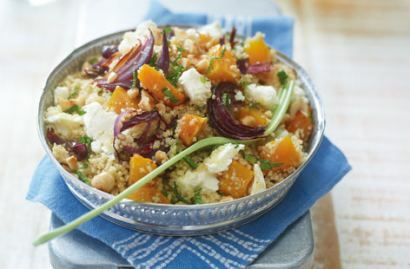 Add the butternut mixture and feta cubes to the couscous, moisten with extra olive oil if necessary and toss.